It is difficult to achieve nano-level surface finish on freeform surfaces. Femoral (knee joint) is one of such components which has freeform surface. Finishing operations are very costly and time consuming. Surface finish of femoral plays a major role in its functionality, efficiency, and life expectancy. To have uniform (or minimum variation) surface roughness value along its curvature, an inverse replica of the femoral component as a fixture has been designed and fabricated so that the magnetorheological (MR) fluid velocity is approximately constant in different areas of the femoral. In this work, an attempt has been made for achieving comparatively more uniform finish on different surfaces and reducing the time required for finishing femoral. For this, a special tooling is used in rotational-magnetorheological abrasive flow finishing (R-MRAFF) process. Different extrusion pressures have been used to examine the effect on percentage change in Ra, finishing rate, and final surface finish of the femoral in both directions, X and Y. Minimum surface roughness of 78 and 89 nm has been achieved on femoral from the initial surface roughness of 172 and 178 nm in X- and Y-directions, respectively. We acknowledge the help of Manufacturing Science Lab and 4i Lab, IIT Kanpur for extending their facilities to fabricate fixtures for femoral and other devices. 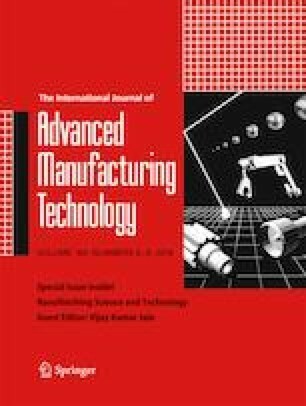 This paper is a revised and expanded version of the paper entitled “Preliminary investigations into nano-finishing of freeform surface (femoral) using inverse replica fixture” by Leeladhar Nagdeve, V. K. Jain, J. Ramkumar, presented at the 6th International and 27th AIMTDR Conference (2016) held at College of Engineering Pune, India, during 16–18 December 2016.